Basic Nutrition Tips, Tools, etc. How do I cook my vegetables? One question we get a lot is “Why aren’t there many vegetable recipes in the Maximized Living Nutrition Plans book?” Many people interpret this to mean that Maximized Living promotes meat consumption over vegetables. While the Maximized Living Nutrition Plans encourage good quality, organic, free range, pasture fed meats, it also recommends a that substantial portion of you daily intake should come from fresh vegetables (and fruits if on the Core Plan). One of the reasons there are very few recipes for vegetables in the book is simply because vegetables do not require a lot of preparation. Typically, a light steam or sautee with some added “good fats” and seasonings is all it takes to prepare vegetables. Therefore, no recipe is really needed. There are many different ways to combine vegetables, spices, and sauces but it is up to personal preference. Here are some examples of some great ways to prepare different vegetables. 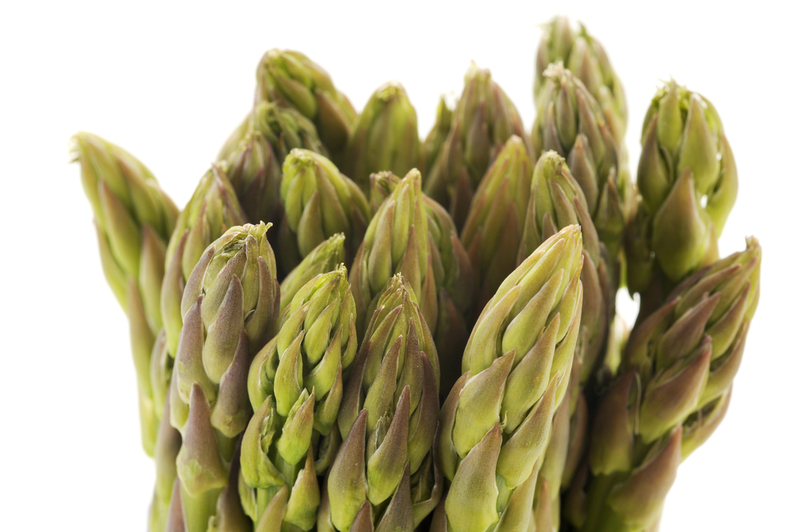 Asparagus: Drizzle with avocado oil or coconut oil, sprinkle with sea salt, grill on an indoor grill pan or roast in the oven at 350 degrees for 8-10 minutes. Also great with a homemade organic hollandaise sauce. Bell Peppers: Red Bell Peppers: make sure you buy these organic but a great way to prepare them is to broil them in the oven until the skins are blistered and blackened- you will have to flip them several times. Take them out of the oven and place them in a paper bag and let “steam”. The skins will peel right off and you are left with the tender, flavorful flesh. Eat plain or add to other dished. You can also add some olive oil and place in the refrigerator for later use. Green Bell Peppers: great sautéed with sliced onions for fajitas or raw on salads or as “scoopers” for guacamole instead of chips. 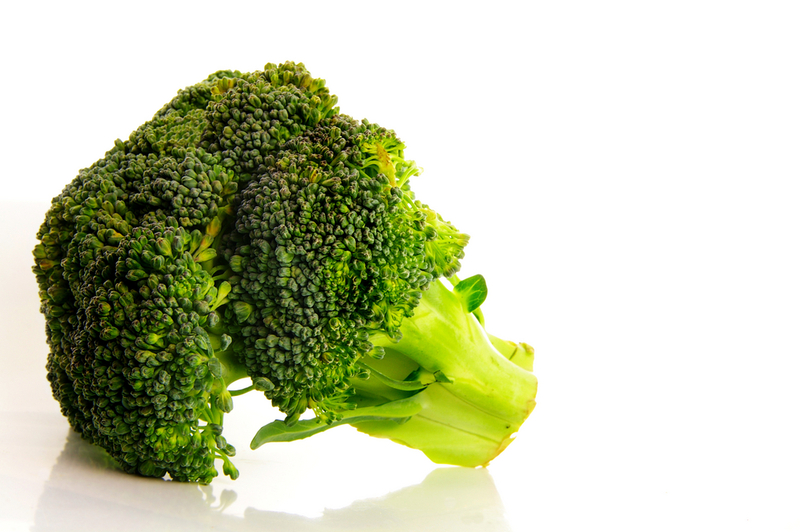 Broccoli: Lightly steam and add butter and garlic powder OR heat olive oil lightly (do not let smoke) in a saucepan and melt 1-2 anchovies – pour over broccoli. The anchovies melt into the olive oil leaving a very tasty, salty, topping. Brussels Sprouts: Cut sprouts in half – sautee in 1-2 tablespoons of avocado or coconut oil plus 1-2 tablespoons of butter. Sprinkle with sea salt and pepper. You can also add finely chopped shallots or onions to the sautee. Great topped with crumbled organic turkey bacon. Cabbage: Chop or slice thin and sautee in coconut oil or grapeseed oil and butter. Sprinkle with sea salt, pepper, and celery seed. You can also slice very thin for cole-slaw. Just add homemade mayonnaise or vinegar, salt and pepper, lime or lemon juice and add any other vegetables you would like. You can also use cabbage to make saurkraut or kimchi. Great in any stir-fry or salad as well. Cauliflower: Great sautéed or roasted in the oven with olive oil, garlic, and capers. Cauliflower is also the perfect substitute for mashed potatoes. Just steam the cauliflower and put it in a blender with a little organic milk or almond milk, garlic, sea salt, and pepper. Cucumber: Perfect addition to salads. Also good mixed with chopped tomatoes and topped with olive oil, lemon juice, sea salt and pepper, and fresh dill. Eggplant: Slice into 1/4 “ slices (longways or in rounds) and place on a baking sheet covered with parchment paper. Drizzle with olive oil, sprinkle with sea salt and pepper. Greens: Use raw in salad and drizzle with olive oil and balsamic vinegar (If using swiss chard or kale, massage the oil into the leaves. This will make them much more tender and flavorful). Wilt lightly in a saucepan with olive oil, crushed garlic, and a small amount of apple cider vinegar. Sprinkle with sea salt, pepper, and crushed red pepper or a couple of grates of fresh nutmeg if desired. Green Beans: (really a legume): For crunchy, fresh flavor: steam and add butter, healthy oil, sea salt, pepper, and crushed walnuts. For more tender beans: boil in a small amount of water until desired doneness and top with sea salt, pepper, crumbled turkey bacon, etc. Raddichio: very good drizzled with olive oil, sea salt, and pepper and grilled. Squash – Acorn or Butternut: simply cut the squash in half and place face down on a baking sheet lined with parchment paper. When done, scoop out the insides and add sea salt, pepper, and any blend of cinnamon, nutmeg, ginger, stevia. Mushrooms: great raw in salads or sautéed with any other chopped vegetables for a stir-fry type dish. Zucchini & Yellow Squash: These are great cooked together. Heat coconut oil and butter in a frying pan to medium heat. Add chopped zucchini and yellow squash to the pan and do not stir until it is slightly browned. Add preferred seasoning blend with sea salt and pepper. Stir and cook until desired doneness. Blend everything up until frothy and the coffee beans and ice are incorporated. PS – People always ask me if coffee is OK…my answer is that coffee, in moderation, is OK. However, everyone’s definition of moderation is different. 1 cup of coffee a day would be moderate. Obviously, organic is better than regular and stay away from decaffinated (dangerous processing) and instant coffee. The only caveat to that is that we never want to see anyone “addicted” or “slave to” any food or substance. 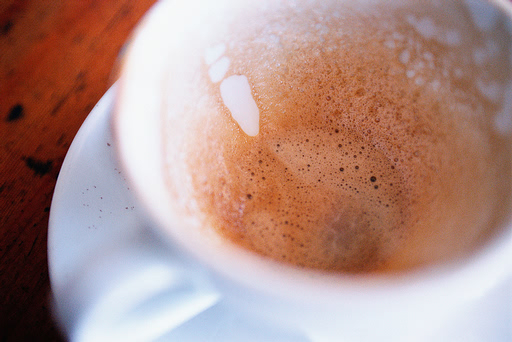 You never want to have to rely on something like caffeine to get started in the morning. If you feel like you HAVE to have your coffee in order to make it through the day, that is more of an addiction and should be overcome. My son and I went out to the garden yesterday and hunted through the tangled bean vines and came in with a whole pot full. 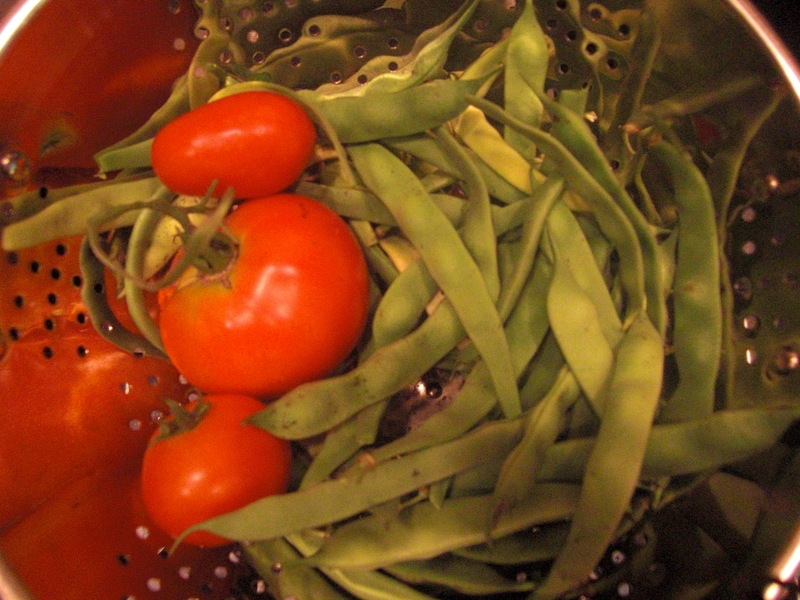 There is nothing more satisfying than eating food that was grown in your own back yard. My husband graciously build up a fenced in garden area so that the monstrous rabbits that co-habitate with us can’t eat everything. My mother in law runs the planting operation, and my kids and I are on picking duty. Even if you just grow 1 tomato plant, it is worth it! 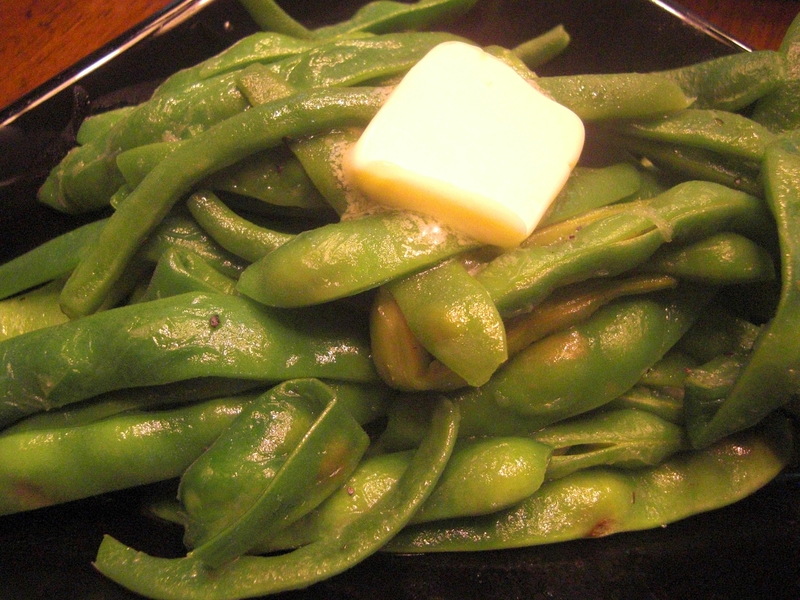 I steamed these beans and put some salt and butter just before serving. Delicious! I’m not sure I would have ever believed that Kale chips would be a good replacement for potato chips but these things are awesome. The trick is to use a dehydrator to get the crispy texture. I made these as samples at our Total Food Makeover last Saturday and I had so many comments about how good they were. 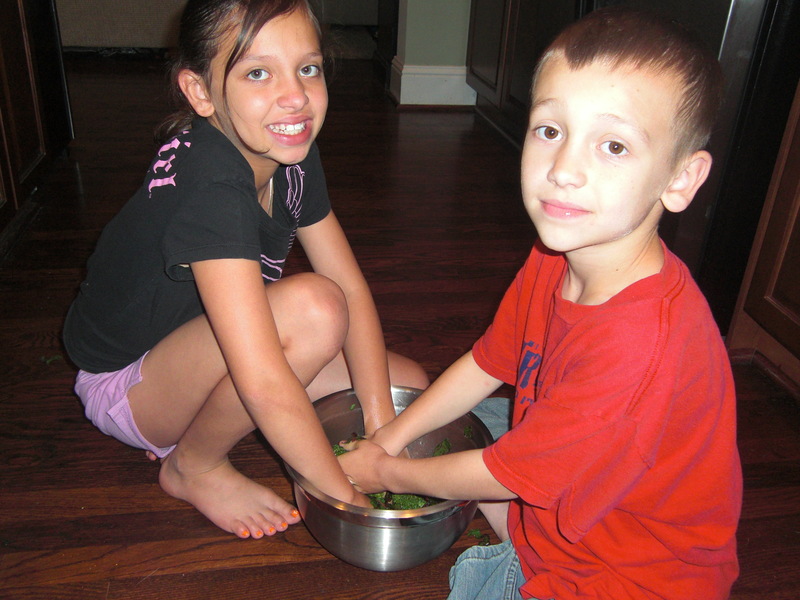 Here you see my kids “massaging” the kale to get it prepared for the dehydrator. Any other spices you would like: garlic powder, chili powder, red pepper, etc. #1 – Prepare the kale – I prefer to leave most of the stems in but if you are preparing for kids or skeptics, you may want to cut out the hard stems. Chop into bite sized pieces and put in a big bowl. #2 – Add the rest of the ingredients and here’s the trick: massage the kale to incorporate all of the flavors and to soften the texture. It should be about 1/2 the size of where you started. #3 – Spread on the sheets of a dehydrator. (I use an Excalibur that I bought refurbished for about $150- it has 9 dehydrating shelves). Set dehydrator for 115 degrees – this keeps all of the enzymes in tact meaning it is still considered a raw food. The dehydration process takes about 8 hours. I usually put it in before bed and it is ready to go first thing in the morning. ALTERNATE METHOD: You can bake them in a 350 degree oven for about 10-15 minutes but you lose the raw status and they are definitely not as crispy. We are over the halfway mark with our Lighten Up Weight Loss Challenge group. I am LOVING hearing about all of the weight loss and how people are spending more and more time in their kitchen, experimenting with recipes, and realizing that healthy food can actually taste great! After this post, I will be posting some recipes that accompany some of the meals. So be on the lookout and give them a try. Some of them have come from Lighten Up participants! At a wrestling tournament for 2 days straight- had to pack EVERYTHING! Here are our meals for the week. We have received a lot of feedback that they are very helpful for people new to the Maximized Living Advanced Nutrition Plan. These are not just ideas…this is EXACTLY what we ate all week. You should notice that the meals are easy to pull off- no exotic ingredients or difficult recipes. Anyone can do this! You will also notice that we were out of town on Thursday through Sunday of this week. Many people think that this nutrition plan is not possible when travelling but you will see that it can be done. I did whip up a couple of snack items to take with us but other than that, everything else was purchased at restaurants. Alas, it can be done!